Hãng sản xuất: Particle Measuring Systems, Inc. The BioLaz Real-Time Microbial Monitor provides real-time detection of biological organisms in controlled environments used for the manufacture of sterile products. The sensor can be connected directly to Pharmaceutical Net, FacilitySight, or your own software, and is designed to operate unattended for continuous operation. The BioLaz has been independently tested to meet the rigorous requirements of USP Validation of Alternative Microbiological Methods and of EP 5.1.6 Alternative Methods for Control of Microbiological Quality, for the Pharmaceutical market. The BioLaz Real-Time Microbial Monitor has been designed with a small footprint in a 316L stainless steel enclosure to fit in space constrained. The unit provides its own air flow using an internal pump, eliminating the cost and need for external vacuum lines. 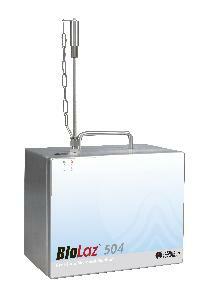 BioLaz Real-Time Microbial Monitor samples air into the sensor via a stainless steel sample probe. As the air passes through the system it is illuminated by a laser and the biological particles fluoresce. The fluorescing biological particles are then counted in one of two size channels, depending on their size. Capable of single Bio-Count detection. One Bio-Count is representative of one CFU. Validated to USP and EP 5.1.6 requirements. Not constrained by physical and biological efficiencies associated with impact air samplers. Not constrained by the type and quality of the growth media. Real-time, continuous counting free from error sources including contamination, mishandling, and inaccurate counting.